“The Emerald Leopard.” Brooke GREEN: Bone Burning Tunes (2014); The Shades (2012). Elena KATS-CHERNIN: Eliza Aria (arr. GREEN, 2012). 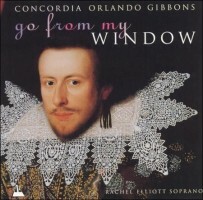 Orlando GIBBONS: What is our life? ; Ah dear heart, why do you rise? ; Fair is the rose; Trust not too much, fair youth; The Silver Swan (all 1612). Thomas MORLEY: Sing we and Chant it (1595). Andrea PANDOLFO: Albanese (arr. GREEN, 2011). John DOWLAND: Flow my tears (1600); In Darkness (1610); Can she excuse my wrongs (1597). Ross EDWARDS: Miniatures (arr. GREEN, 2007). Brooke GREEN: Travelling to the Question (2011); Shades of Presence Past (2013); This Body is Not Me (2013). 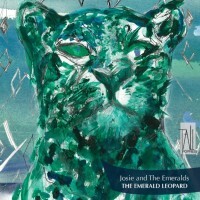 Josie and the Emeralds: Josie Ryan (sop), The Emerald City Viols: Brooke Green (dir. ), Laura Moore, Catherine Upex, Fiona Ziegler; guests. Tall Poppies TP 233 (1 CD) (http://www.tallpoppies.net/). Get this disc by Josie and the Emeralds, an enterprising soprano and quartet of viols in Australia, for the two-thirds that’s new to us. The olde part is handled less ideally. The headnote keeps the playing order, with Gibbons, Morley and Dowland surrounded by the group’s contemporary items. Gibbons’ songs receive well-knit accompaniments, but I find Josie Ryan’s vocals a touch emphatic. Compare Rachel Elliott’s more pointed renditions of What is our life? and The Silver Swan, on Concordia’s Go from My Window (Metronome, 2001). The great 1975 account of Gibbons’ whole book is long gone (Rooley / Consort of Musicke, Decca CDs, 1998 and 2005). A trio of Dowland hits is up and down: Flow my tears displays the group live, while In Darkness succumbs to vehemence. Can she excuse my wrongs is so winning that I wanted to hear If my complaints after it. The Flashing Mountain and Hot Date set encounters with death in Dorothy Porter poems, resigned and satiric. The first is a chorale for “a tense second of white steel,” the next a patter song (“let’s talk, Death”) with snapping rhythms. The Shades (viols only) achieves a jogging momentum, with subtle interplay between treble and tenor parts. Miniatures (viols only) adapts four Ross Edwards items. I can conjure a string quartet version, but the viols locate a specific gravity (especially on Lullaby, the longest one). Soprano Belinda Montgomery joins Ryan for Travelling to the Question. It’s hard to tell them apart, but rôles stay distinct. Then those switch, before the duo launches O Vis Eternitatis (Hildegard von Bingen). In four sections, Shades of Presence Past has a sizable reach. Mournful and lilting in I, the treble viol in II leads the rest in a Baroque dance. A popular Elizabethan lyric, My mind to me a kingdom is, requires confident singing and Ryan supplies it. IV is very busy with ornaments and reprises; the sawing bowstrokes from a later age show wit. Starting and ending on a struck bell, the finale This Body is Not Me artfully combines a 13th century lai and a Buddhist poem. Private associations (covered in Green’s superb notes) can overwhelm, but restraint is apparent here.